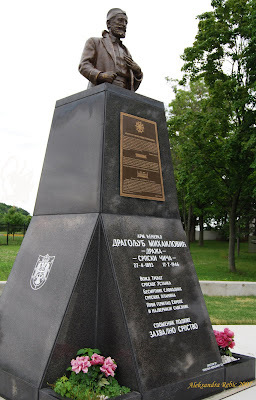 at St. Sava Monastery in Libertyville, IL U.S.A.
Voyvoda Momchilo R. Djujich is now there permanently beside his commander General Draza Mihailovich, along with Voyvoda Pavle Djurisic, all facing east toward the far away Serbian lands where their legacies were forged over 60 years ago in the battles that proved their measure as men. All three were leaders of a cause that remains alive in the hearts of those who came to pay tribute on May 20, 2007 at the St. Sava Monastery in Libertyville, IL. 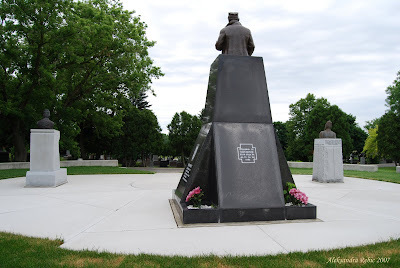 Many of their fighters are buried here on the lovely grounds of this beautiful Serbian Orthodox Monastery, and the many who came on that Sunday were reminded of their sacrifice and their courage, now immortalized for always. People of all ages came from America, Canada, England, Germany and Australia for the blessing of the newest monument on the St. Sava grounds, as well as the blessing of the new memorial park dedicated to the legacy of the three men. 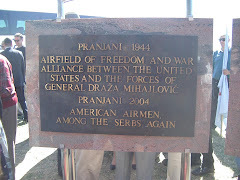 The over 700 visitors included members of the Djujich and Djurisic families and old veterans who had fought under these men. Though previous commitments kept me from being there in person I was there in spirit, for the cause represented by these three men has always resonated very personally with me, from the time I was a child first learning about Draza Mihailovich and the Chetniks. My father Rade Rebic, who knew Voyvoda Djujich personally and had the honor of working closely with him in America as a respected confidant, did attend the dedication. I know that for the brief period of time my father was on the memorial grounds, Voyvoda came back to life for him, and the memories came flooding back. This monument means a lot, not just to those that were there that day, but for the future generations who will visit and ask about these men whose images are now permanently preserved. The monument is a direct reflection of the efforts of the Chetniks to preserve the true legacy of a nation they loved and worked so hard to keep free from the tyranny of those who sought to destroy it. The Chetniks remained faithful to their cause, and though many were forced to leave their beloved homeland and make their lives elsewhere after the war, their hearts remained in the Serbian lands through all these years. 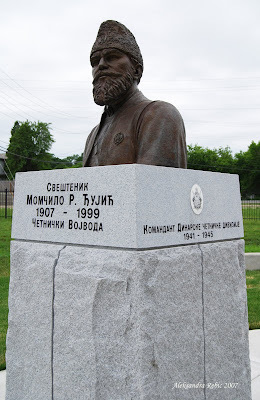 Voyvoda Djujich never returned to his homeland, but he dedicated his life’s work after the war to honor the beloved land for which he had fought so faithfully and so courageously. 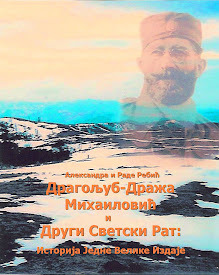 Djujich remained faithful to the last day of his life and stayed consistent in his belief that Serbia must return to her democratic soul no matter which way the political winds turned or which enemy was determined to crush her spirit. I’ve met many people throughout the course of my life, but very few who exemplify the dedication and the determination that Voyvoda Djujich did. 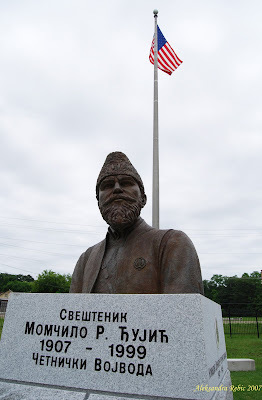 I met the man only once, in Indiana in the early 1990s, at the celebration of “Drazin Dan”. I had my photos of the first Serbian parade that had taken place in Chicago in the summer of 1992. 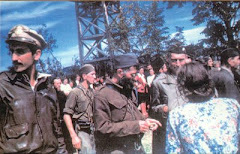 I had designed a float dedicated to Draza and his Chetniks and took my photos of the parade with me that day to show Voyvoda. I remember so vividly walking into the room where he was sitting and though there were other people in that room only one drew everyone’s attention. There are very few people on this earth who have that special quality that is indefinable – one knows that they are in the presence of such a person when the whole aura in the room changes when they leave or enter the room. 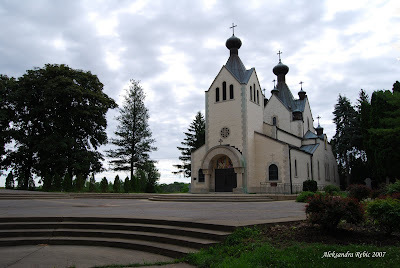 Though not easily intimidated by people or overwhelmed by their presence, I found it impossible not to feel humbled in the presence of Voyvoda Djujich. I was in the presence of a living legend and felt it in my bones. He was cordial and took the photos to look at them, going one by one. 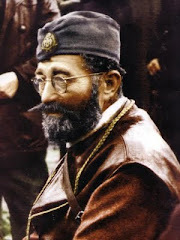 When he came to the one of my father sitting on my Chetnik float he looked at it for a long time then asked if he could keep that one. Of course, I replied. Inside I felt so proud that of all the photos of the parade I had shown him, the one that struck him - the only one Voyvoda wanted to keep - was the one with my father in it. I don’t remember all that we spoke about that day. I wish I did. I wish I had filmed it. I wish I had more pictures. But I remember his face. And I remember most his presence and easily understand why his people remained loyal to him. This was a true hero, and though I would never see him in person again, we kept in touch via postal mail. He was always very kind and supportive of every effort that my father and I were involved in, fighting for the Serbian cause here in the United States during the hardships of the 1990s when Serbia’s survival and legacy were once again under attack. When he passed away on September 11th of 1999 at the age of 92, I felt like I had lost a mentor. I can’t even imagine what those who had fought with him and worked with him felt. He had been a lifeline to the old days and a beacon of light through all the years afterwards, for he remained a constant living reminder of the promise of heroism and dedication to a cause worth fighting for. 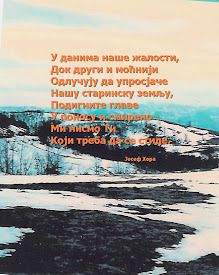 Voyvoda Djujich was an exceptional visionary. 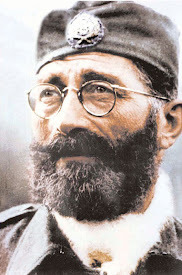 He understood early on in World War II how important it was to fight for the survival and freedom of the Serbian nation. 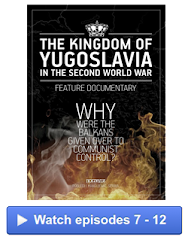 No Nazis, Ustashe, Yugoslav communists, or later NATO forces were able to crush that resolve or destroy the legacy established by Voyvoda and his men and their supporters as they fought, both during the war and all the years afterwards, to cherish and preserve Serbdom. 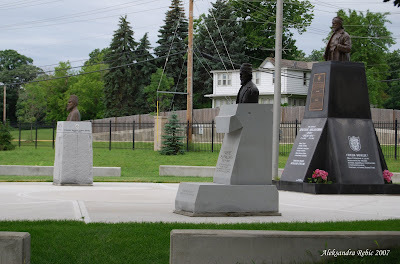 The three men whose monuments now stand together at St. Sava Monastery represent perhaps better than anyone else the unity that Serbs have striven for in their struggles. 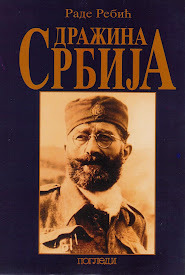 The Serbs of Serbia, the Serbs of western Krajina in the lands of Kordun, Banija, Gorski Kotar, Lika, Dalmatia, the Serbs of Bosnia and Hercegovina and the Serbs of Montenegro all fought under these men as brothers with the same goal. They are and will remain a reminder of how important and vital unity and fighting together for the common goal is, especially when facing enemies who seek to divide and conquer. 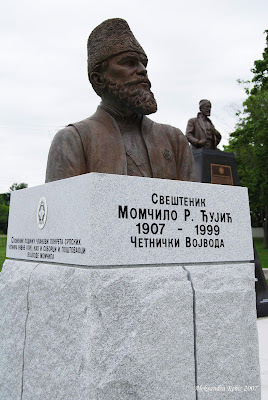 These monuments, erected on Serbian hallowed ground far from those lands, unite the Diaspora with those lands in a bond that cannot be broken by distance or time. 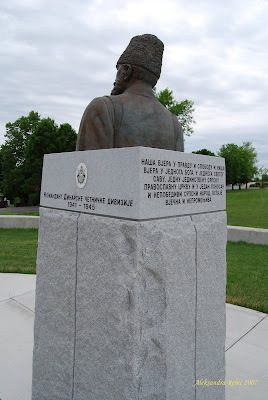 That sense of unity, dedication and purpose will be forever preserved here where Christian Serbs come from near and far to share their faith and rededicate themselves to the cause for which these three men fought. 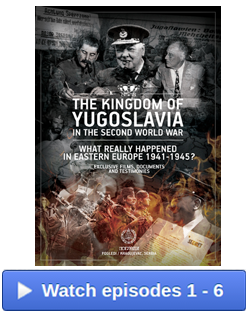 Voyvoda Djujich and Voyvoda Pavle Djurisic stood by General Draza Mihailovich during some of the darkest moments in Serbian history. They never wavered. Now, all three are together and here they will stay forever. Leaders come and go, events change history, and causes are born and causes die. Some are abandoned while others prevail and rise above the circumstances that challenge their successful completion. 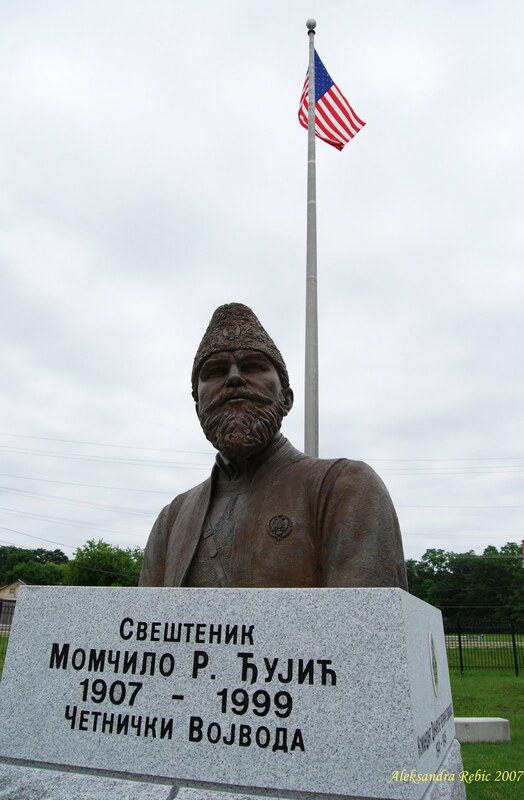 Here at St. Sava Monastery in America, thousands of miles from their homeland, three giants of Serbian history stand together to inspire future Serbian generations to fight for a cause that must never be abandoned and to remind them that their greatest strength lies in their unity under the flag of a united Serbian nation. 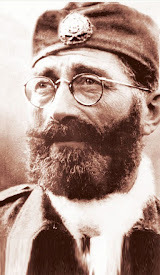 I’m proud to have known this man, Voyvoda Djujich. I still have his letters. I’m even more proud of the fact that he held my father in such high regard and that the two of them worked together on important things that were worth working for then and are worth working for now and forevermore. 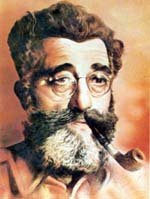 Voyvoda would have been 100 years old in 2007 and 100 years from now he and his legacy will still be remembered and honored. Thank you to those that made this monument a reality and who have given this gift to all of us and all those who will enjoy and be inspired by it in the future. Voyvoda will be pleased.